Scientists have revealed never-before-seen details of how the human brain sends rapid-fire messages between its cells. Researchers at the School of Medicine and the Department of Energy’s SLAC National Accelerator Laboratory mapped the 3-D atomic structure of a two-part protein complex that controls the release of signalling chemicals, called neurotransmitters, from brain cells. Understanding how cells release those signals in less than one-thousandth of a second could help launch a new wave of research on drugs for treating brain disorders. The experiments, at the Linac Coherent Light Source X-ray laser at SLAC, build upon decades of previous research at Stanford and the national lab. “This is a very important, exciting advance that may open up possibilities for targeting new drugs to control neurotransmitter release,” said Axel Brunger, PhD, professor and chair of molecular and cellular physiology and professor of neurology and neurological sciences. “Many mental disorders, including depression, schizophrenia and anxiety, affect neurotransmitter systems.” Brunger, who is also professor of photon science at SLAC and a Howard Hughes Medical Institute investigator, is the senior author of the paper. The first author is postdoctoral scholar Qiangjun Zhou, PhD. The two protein structures are known as neuronal SNAREs and synaptotagmin-1. Earlier X-ray studies, including experiments at SLAC’s Stanford Synchrotron Radiation Lightsource, or SSRL, nearly two decades ago, shed light on the structure of the SNARE complex, a helical protein bundle found in yeasts and mammals. SNAREs play a key role in the brain’s chemical signaling by joining, or “fusing,” little packets of neurotransmitters to the outer edges of neurons, where they are released and then dock with chemical receptors in another neuron to trigger a response. In this latest research, the scientists found that when the SNAREs and synaptotagmin-1 join up, they act as an amplifier for a slight increase in calcium concentration, triggering a gunshot-like release of neurotransmitters from one neuron to another. They also found that the proteins join together before they arrive at a neuron’s membrane, which helps to explain how they trigger brain signaling so rapidly. “The neuron is not building the ‘gun’ as it sits there on the membrane — it’s already there,” Brunger said. Thomas Südhof, MD, a Stanford professor of molecular and cellular physiology and HHMI investigator who shared that 2013 Nobel Prize with Rothman, discovered synaptotagmin-1 and showed that it plays an important role as a calcium sensor and calcium-dependent trigger for neurotransmitter release. To study the joined protein structure, researchers in Brunger’s laboratory at the School of Medicine found a way to grow crystals of the complex. They used a robotic system developed at SSRL to study the crystals at the Linac Coherent Light Source, an X-ray laser that is one of the brightest sources of X-rays on the planet. 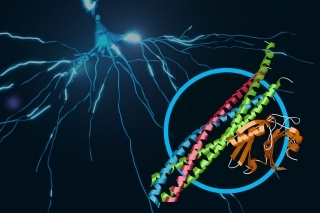 “This experiment was the first to use this robotic platform at LCLS to determine a previously unsolved structure of a large, challenging multi-protein complex,” said Aina Cohen, PhD, co-head of the Structural Molecular Biology Division at SSRL, who oversaw the development of the highly automated platform used for the neuroscience experiment. “This is a good example of how advanced tools, instruments and X-ray methods are providing us new insights into what are truly complex mechanisms,” added Cohen, a co-author of the study.